Missed the Grand Wedding Show last weekend? Oh no! Don’t worry though – you can catch a few of our highlights with our expo round up. Dig out your running shoes, round up your bridesmaids and get your parents off the couch – Brooke Howard-Smith is here he’s got a $70,000 wedding prize up for grabs. Register for the nationwide Bridal Bootcamp (or get one of your nearest and dearest to) and you’ll receive a 13-week training and nutrition program – the participant with the most impressive overall transformation wins a wedding package including a custom-made AnnahStretton dress, a honeymoon to Raro – a complete wedding package indeed! 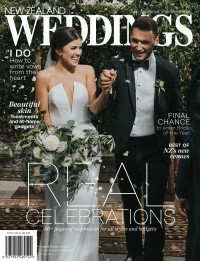 Plus, New Zealand Weddings readers will receive an exclusive discount upon entering – register using the promo code ‘weddings’ to register for $99, down from $180. What’s better than a macaron? A macaron that (literally) has your name on it, of course! Using free-range eggs and hand piping, macarons.co.nz tailors your macaronflavour and colour to your wedding theme then tops each one with hand-painted designs. Perfect! The Sweet Bites Cakes stand is always a sight to remember, and this show’s display was nothing different – bedecked in blossoms, glimmer and glean, it was a feast for the eyes as well as the taste buds – if you managed to score a sample slice, you’ll know exactly what we mean. Those on the hunt for dress inspiration needed not look much further than Vinka Design’s riveting display – with a delicious selection of gowns (many rustling fresh off the NZ Fashion Week catwalk) there were feathers, bead, tulle – decadency to satisfy the most glamorous bride. ArtyInk’screations never fail to inspire – if you haven’t already stumbled across their chic guestbook alternatives, we suggest you make it your business to do so immediately. Choose a neat parcel of heart-shaped notecards to be signed and arranged (by ArtyInk) into a chic frame, or let your guests unleash their inner FridaKahlo and sketch a stack of self-portaits.